If the person I loop spuds up I am considering trading Burgess to Macca given I am sitting 52nd and dont want to lose pace with the top. This week not a great one for looping Katoa. Can get a free look at Havili. Or set up a potential swap with Thompson and Isaako. If I did keep Katoa, would you lose Havili, Croker, Doueihi or Isaako. Katoa is due back next week anyway. If he's not helping you this week he's probably better to move. That being said, while it will take a while for Katoa's -3 to go from his score he's still a better cow (hopefully) than anyone else I can immediately see. Personally I see no rush for trading out either Isaako or Croker as I'm sure they'll have a good score soon enough and are good covers for positions I don't see a lot of depth at nor want to waste trades in. From the bench Doueihi has 1 week before he's likely a must trade. Need to make sure you have cash or a target for this. Havili isn't urgent with at least one more good rise. But with all the points above he would be my first choice this week. Fifita still with a high BE this week. Maybe hold? I'd rather Doueihi to Fifita next week to leave some more coin from their prices getting closer. I also like Maloney as a cashout this week if you have a NAS/SST/Croft etc. thats higher you want out of. More cash will fund good upgrades for these guys in the next few weeks. As another option you could perform a loop with your WFB's. I'd probably try it with Thompson and Dufty as they are likely to score less than Tedesco and Ponga. Note: You can organize bench positions 14-18 any way you like, depending on how you think those players will score. I put Croker in position 21 because I think he will be your lowest scorer, but you can have Rochow or Lodge or TPJ in that position if you prefer. Do not put Havili or Cook in position 21 as they play before (or at the same time as) the St.George game and will be locked into their respective positions. Doesn't matter who you decide to loop with but agree with yourself a number you are happy with before the game. Easier to be more subjective before the game I find. Also sometimes looping caps your team. Note that Thompson and Dufty might both gun it and you can't get both their scores if you loop them. I like both of these guys above Havili. If I could see Thompson or Dufty before Havili that'd be different. With your team I'd stick with Milch's loop as I think its your best team and protects you if Havili goes huge (I see this as super unlikely). I'd have Thompson or Dufty sitting in spot 19. Although to clarify, the reason you do not want Cook in 21, is not because he plays early. Cook is one of your best scorers and you will want to play him every week anyway. He is not worth stuffing around with for loopholes. Havili likely won't help you keep up (36 and 33 are both his high scores with a try). All depends on the question - What score do you want and how much do you value trades? Will this work as a loophole? If JMK goes nuts tonight I can leave as is, if he has another poor score I can swap Kennar with Maloney?? @Liverpool_Bulldog wrote: Will this work as a loophole? If JMK goes huge, I swap Leilua with Fonua. 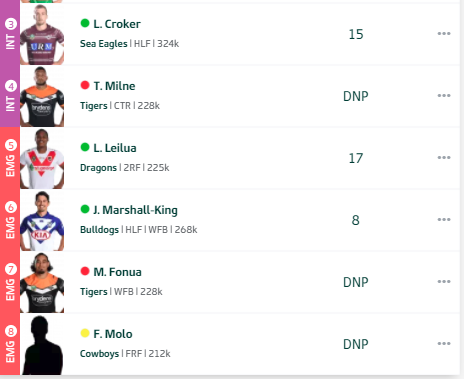 Then if Leilua goes massive I can swap Croker for Molo. From my view point yeah that looks fine random. @Random wrote: Am I doin it right? Cheer's fella's. Just wanted to make sure my first loophole of the year is a good one. Also you get a sneak peak at my Auto-Fill team. Haha I don't know wether to put JMK or Havili in my loophole? I guess they both end up scoring 30. Depends which has the capability to go large. @Liverpool_Bulldog wrote: Haha I don't know wether to put JMK or Havili in my loophole? Will the non-looper be part of your 17? JMK probably the bigger chance of going large. If Havili pops out a 30 like he has been all season, would you loop or keep his score? I think looping Havili is just going to lead to an awkward choice about whether to risk the score or not. They are fighting for 18th spot. Kennar in at 17. If the guy in 18 busts out a dud score tonight I'll bring Maloney in for Carty and swap him for Kennar. Does that make any sense. I've lost my loophole virginity. Feels good but wish there was more upside. Ricky plays Havili for 80 minutes tonight because he just keeps scoring tries. New banner here next week. Just realised i can potentially double loop this week. Kennar into 17 with Havili 18 gives me his 46, but i can also put Rochow into 19 and get a look at his score, using TPJ (if he is out) in the FRF 13 if he goes alright. So whose score should i miss out on if i need to loop Rochow- Lodge or Kikau? ?